UPDATE: The Cariboo Regional District has issued an expanded evacuation alert for the Narcosli Creek area. Please note, no properties east of the Fraser River are on evacuation alert. 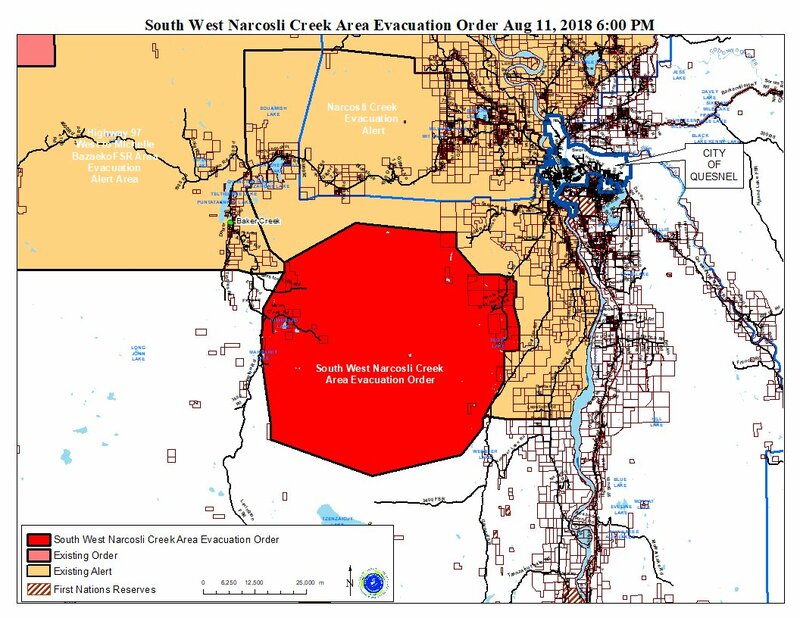 This alert is replacing the Narcosli Creek Area Alert issued on August 10, 2018 at 12:00 pm. Please visit the Cariboo Regional District website and online searchable map for more details or call 1-866-759-4977, which is open 8:00 a.m. to 11:30 p.m.
WILLIAMS LAKE, BC: Effective immediately, the Cariboo Regional District has issued an evacuation order for 33 properties in the Narcosli Creek area. Due to immediate danger, members of the RCMP or other groups will be expediting this action. Register at the ESS Reception Centre at Exhibition Park at CN Centre at 2185 Ospika Blvd in Prince George.